Trips to the dentist's office aren't just expensive — they can be quite painful, too. From hacking away at plaque or picking through any gaps in your teeth to check for cavities, it takes a lot to remind yourself that it's good for you (despite how terribly invasive it feels). A better alternative would be taking special care with your oral hygiene now — for example, using this complete Home Dental Center to improve the health of your teeth and your gums could minimize the number of trips you need to take to your dentist (helping you save money over time). This countertop station includes a powerful ultrasonic toothbrush and a smart water flosser that effectively cleans your teeth without agitating your teeth and gums — especially if you're on the more sensitive side. 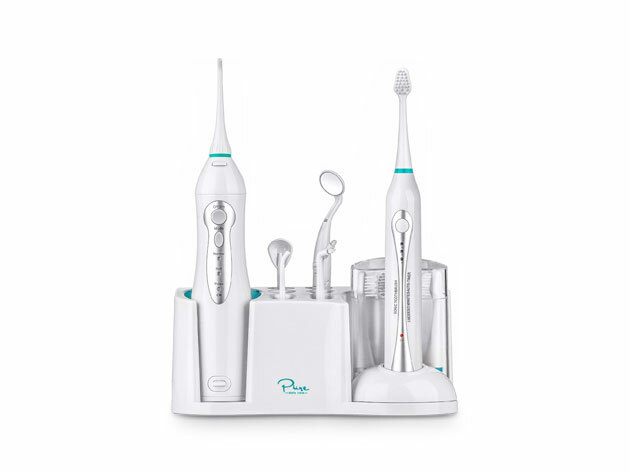 The toothbrush blasts away plaque with a motor that delivers 31,000 vibrations per minute (VPM) — plus, you can customize your clean with three distinct cleaning modes. The water flosser uses strong, yet gentle jets of water, to dislodge food, massage your gums and improve your gum health. The kit manages your tooth cleaning experience for you — it even includes an auto-time to ensure you're brushing for the right amount of time. Usually, this Home Dental Center is $99.99, but you can get it here for $69.99.